I've been a fan of Bob Mould's music for more than 20 years as of the time of this writing. Hüsker Dü, Mould's seminal 1980s punk band, broke up during my sophomore year of high school (1987) just as I was losing interest in the heavy metal of my youth, and learning to love punk and "college" rock. The Hüskers, as they were affectionately known back then, were one of the first bands that really connected with me after I gave up on metal. The band had much of the same power and energy that I liked in traditional hard rock, but the lyrics dealt with more than getting fucked, getting fucked up, or driving around looking for girls. I have nothing against any of those things, but one can only take so many songs about the same topic. Hüsker Dü's songs were sometimes political, yet they were not a political band. Most of the songs dealt with personal politics, or the way people treat one another, and the way we, as people, expect to be treated by others. Both Mould, and his song writing rival, drummer Grant Hart, were strong lyricists that wrote about similar things in different ways. Mould was always more direct and overtly (it seemed) autobiographical, whereas Hart's songs seemed more abstract lyrically. The difference served the band well, and is a big part of the reason Hüsker Dü's music is still as relevant today as it was in the 80s. Beyond the lyrics, Bob Mould has always been an innovative and unique guitar player, as well. Hell, he shreds! The guy is a powerhouse on his instrument of choice. The band's sound - a mix of ferocious, guitar driven punk rock with Beatle-y melodic tinges - served as the basic blueprint for what we think of as "alternative rock" nowadays. There would be no Pixies, no Nirvana, no Green Day, or no Blink 182 (just to name a few) without Hüsker Dü. Just as The Velvet Underground and The Stooges paved the way for all the punk rock of the 70s and 80s, the Hüskers did the same for the late 80s and the 90s. Once I discovered bands like Hüsker Dü, how could I ever go back to Dokken or Cinderella? I mean, seriously. After the break up of Hüsker Dü, I continued to follow Mould's work. His debut solo album, Workbook, is among the finest albums of all time. As an album, it is easily his best ever. A truly unique piece of pop music, and one whose lyrics still resonate strongly with me decades later. After another solo album, Mould formed a new band called Sugar. Sugar mined much of the same musical terrain that Hüsker Dü had, except with stronger production values, and only one songwriter. Sugar became more commercially successful than Mould's solo work and that of Hüsker Dü. It was Bob's closest flirtation with mainstream success. After only two albums, Sugar ended, and Mould again went solo. It was about that time - the mid 90s - that I stopped following Mould's work quite as intensely. I still picked up his new album whenever he released one, and still tried to see him perform whenever I could, but the intensity level of my fandom (is that a word?) had died down a bit. Good thing Bob just wrote a biography that can fill in the rest of his story since then, right? Mould has written a new autobiography called See A Little Light: The Trail of Rage and Melody. I picked it up last week (oddly just after picking up Grant Hart from the airport and shuffling him to his hotel for a show later that night), and have been devouring its contents during every free minute. As far as Mould's career goes, I have known the story (as evidenced by the above post) for a while, but I have never felt like I really knew much about Bob Mould, the person. Truth be told, I have met Bob a few times over the years, as a fan. We chit-chatted for a few minutes each time, nothing special. He was always very nice. I interviewed him in the late 90s for a website I blogged for, and he was a great interview, as well. This book, obviously, delves much deeper into Mould than any casual conversation or interview ever could. The book is written in much the same way that Mould's songs are: direct, vivid, and easy to understand. There is no need to try and "touch up" the writing with any unnecessary fluff, the story is compelling on its own. For me, the best parts were his re-telling of the early days of Hüsker Dü. In telling the story, he was surprisingly complimentary toward his formal band rival, Grant Hart; and he was quite critical of bassist Greg Norton. This kinda makes sense in light of the fact that he and Hart were the songwriters in the band, and were the only ones to continue making music after the demise of the band. Still, the level of criticism toward Norton was unexpected. I'm not saying it wasn't warranted, just that I was surprised to see it. The version of events in See A Little... regarding the end of Hüsker Dü was pretty much how I had heard it before. But Bob managed to add some details that I had not known regarding a final band meeting at Hart's parent's home in early 1988, and his calling Grant to notify him that he would be receiving formal notification of his departure in the mail. Well, I won't go point by point throughout the book and tell you how it squares with what I had heard, since I wasn't there and Bob was. Grab the book and read it for yourself. After finishing the book, I threw on some Hüsker Dü records (and Bob's Workbook CD) and listened with slightly newer ears. Many of my opinions about the better or worse Hüsker Dü records were basically matched by Mould's, which I thought was interesting (i.e. Warehouse should not have been a double album). I had known about Mould's homosexuality by the early 90s. It never mattered much to me to begin with, but I now understand what was feeding his reluctance to discuss it until he was "outed" in the media. Fortunately, by that time, there was pretty much no backlash to the news. I don't know of a single person who chucked their Bob Mould albums because they found out he was gay. Chances are, I wouldn't associate with people like that anyways, but that is beside the point. Bob does address the issue in the book at great length, and much of the "relationship Bob" stuff was completely new information to me. Even if you aren't a fan of Mould's music, the book is an interesting read since he is such a pioneer in modern music. The indie network of clubs and promoters that many take for granted nowadays, was practically invented by Hüsker Dü in the early 80s. Bob has lived enough musical history for 10 men. For that reason alone, it should be a must read. Below is a video of Hüsker Dü in 1987 performing "Could You Be The One?" on the short-lived Joan Rivers Show. Mould mentions this appearance in the book, too. 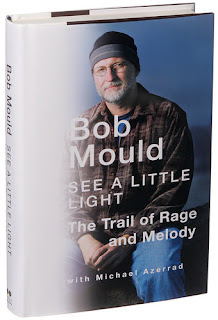 Thanks for the write-up on Bob Mould. I thoroughly enjoyed hearing him play in May, and have had some of his music here and there in the past ("Warehouse" and "Copper Blue"). I may have to check out that book! Good piece. I need to check out some of the stuff he's been involved in.